Government says it is investigating an outbreak of Listeriosis in the country which has caused the deaths of 36 people. At a media briefing in Pretoria on Tuesday, Health Minister, Dr Aaron Motsoaledi, said the source of the outbreak is likely to be a food product consumed by people across all socio-economic groups. From 1 January to 29 November 2017, a total of 557 laboratory-confirmed Listeriosis cases have been reported in all provinces. Most cases have been reported from Gauteng with 345 (62%) cases, followed by the Western Cape with 71 cases (13%) and KwaZulu-Natal with 37 cases (7%). The remaining 18% is distributed in the remaining six provinces. “Out of 557 cases, we are certain of the final outcome for 70 cases. Of these 70 cases, 36 persons have died,” Minister Motsoaledi said. Of the 557 laboratory confirmed cases, 34% were from the private health facilities, and 66% were from public health facilities. “Given that only 17% of South Africans use private health facilities, this proportion of cases from private health facilities is too high. This indicates that the source of the outbreak is likely to be a food product that is widely distributed and consumed by people across all socio-economic groups,” said the Minister. The Centre for Disease Control and Prevention describes Listeriosis as a serious, but treatable and preventable disease caused by the bacterium, Listeria monocytogenes. The bacteria is found in soil, water and vegetation. Animal products and fresh produce such as fruits and vegetables can be contaminated from these sources. Although anyone can get Listeriosis, those at high risk of developing the disease include newborn babies, the elderly, pregnant women, persons with weak immunity such as HIV, diabetes, cancer, chronic liver or kidney disease patients. The age groups that are most affected are neonates – those in the first 28 days of life - and the age group 15 - 49 years. These two groups comprise 70% of all cases. Generally there are four possible sources of Listeriosis - directly at origin for example a farm, a food processing plant, a retail outlet and food preparation at home. Minister Motsoaledi believed for this particular outbreak the most likely possible source is contaminated food at the origin - for example at farms as well as food processing plants. Environmental Health Officers are following up diagnosed cases and are visiting their homes to sample food where available. There are 23 private food tasting laboratories that are accredited by South African National Accreditation System which reports to the Department of Trade and Industry. These laboratories have been requested to provide data on Listeria to date as well as to provide isolates to the National Institute for Communicable Diseases. So far, two have voluntarily submitted isolates from food samples. In addition to this, five food and laboratory associations have also been requested to provide information to their members that have been testing for Listeria. These are the South African Meat Processors Association, South African Milk Processors Association, Milk South Africa, Consumer Goods Council and the National Laboratory Association. Keep clean. Wash your hands before handling food and often during food preparation. Don't get tired of washing your hands. If you are handling or storing raw food, don't touch already cooked food unless you have thoroughly washed your hands and food preparation utensils. In other words separate raw from cooked food. Cook food thoroughly. Never eat half cooked or uncooked food, especially meat products. Food that does not usually need cooking before eating, needs to be thoroughly washed with clean running water. Families with no source of clean running water need to boil their water before domestic use. 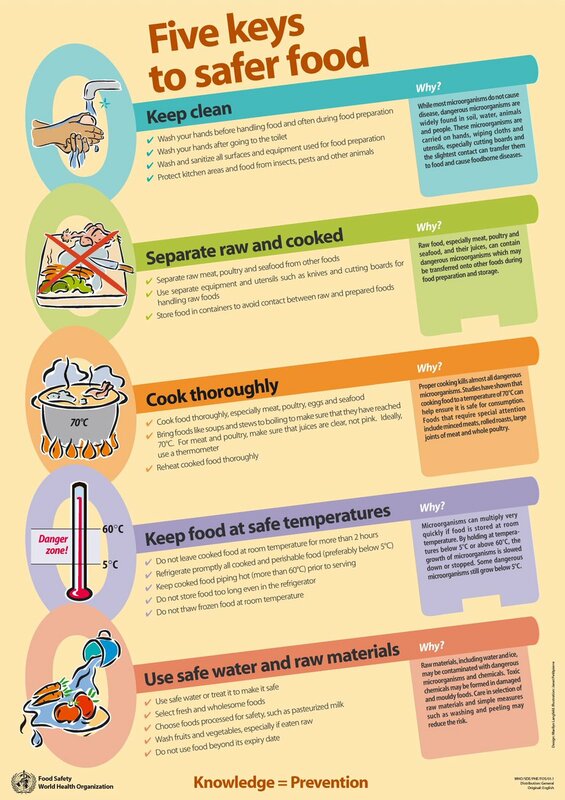 Keep food at safe temperatures. Food that should be kept cold should be refrigerated and food to be served hot should be served hot. Use safe water for domestic use at all times and use pasteurised milk products. In situations where pasteurisation is not possible, for own domestic consumption, please boil the milk prior to use.